Skiing with kids is great fun but can be very expensive, so plan ahead if you want to save some money. Ski clothing is expensive and kids grow quickly so borrow whatever you can or hire it but research before you go. Compare prices at the mountain, the closest town or even where you live for the cheapest option. This goes for hiring ski boots and skis too (kids don’t need poles when they’re first learning). Alternatively if you have other kids to pass hand-me-downs to, you might want to look at buying second hand clothing. Layer up – thermal top and leggings as a base layer, fleece mid layer, and outer layer of insulated, waterproof jacket and snow pants. You can never be too warm! Kids will be miserable if they’re wet or/and cold. Waterproof onezies are great for babies and toddlers. Invest in quality well fitting merino socks preferably that cover the calf. Thick socks aren’t necessary and some say even restricts circulation – thinner socks are also less likely to bunch up and be uncomfortable in boots. Take the socks you plan to wear with you when hiring ski boots. Mittens are better than gloves for warm hands (Fleece gloves inside waterproof mittens keep little hands really toasty). Googles or sunglasses are a must in all conditions. Helmets are again a must – regular bicycle helmets don’t provide enough protection on ski slopes, so you’ll need to borrow or hire one. Balaclavas are great for keeping faces and necks warm. Or have a thin merino beanie that fits under the helmet and keeps ears warm. This could be enough if there isn’t a howling wind blowing! Don’t forget to ask them to go to the toilet before getting all their gear on! Wear sunscreen on any exposed skin – even when it’s cloudy. Check out the early bird season passes (normally available from the October of the prior year) as some resorts offer free passes for children with an adult season pass – if you are going to ski more than 5 days it might be cheaper than buying later in the season. If you’ve left it too late for the early bird passes and your child has never been skiing before, leave it until you’re there. They may have enough fun on the learner slopes for the first few days and won’t need a full pass everyday. You may only be on the slopes for half a day (it’s very tiring) so it’s also worth asking if there are half day passes available. Ski school is a great way to get your kids skiing and gives you some time to ski on your own. Group lessons are cheaper than individual lessons but are restricted to over 5s. Eating on the mountain can be expensive and the range can be very limited so pack your own. Noodle pots are a great snack and most of the mountain cafes offer hot water for free. Another option is Cheerio style sausages heated in a thermos and popped into bread rolls. Camel backs are a great way for kids to keep hydrated while on the go and are easier to carry than a drink bottle. Kids (and adults) can tire quickly so think about starting your days early to miss the rush and grab a close carpark and then finish early too. Think about giving kids a day off as well, especially if the weather isn’t great. Have a plan B of activities other than skiing that you can all enjoy. Have a plan in case your child gets lost. Think about a common meeting point or write your mobile number on their arm. If you are planning a trip during the school holidays always book in advance. 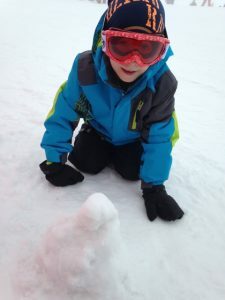 A note on Snow Boarding – most shops won’t hire snowboard to kids under 8 years old. Reasons for this vary and it’s definitely becoming more common to see little borders on the slopes. Just don’t make any promises to your kids if they’re under 8, until you’ve checked with hire shops first! And when you’re not skiing…. Don’t forget all the other fun activities you can have in the snow – toboggan hire is widely available for around $10/day and is great family fun (although note, not in Cardrona where tobogganing is banned!) Then there’s always making snow angels, building a snowman and a good old fashioned snowball fight – all free! See here for a guide to finding hot pools all over NZ – great for rejuvenating achy bodies! Thanks Alison and Lauren for your top family ski tips.